Progressive Commerce supports the increasingly important component of sales that come from Third Party Affiliate relationships. We have the resources to perform the complex transactions that require special tracking and billing to ensure affiliate payment follow through. 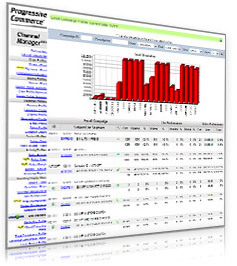 Progressive Commerce's Channel Managersm enables clients to track up to the second sales data based on the type of payment used in each transaction, view number of e-mails opened, and clicked. Email marketing has a great advantage over traditional direct mailing. It is a cost-effective method to increase sales by contacting your customers almost instantly and allows you to see the results of your campaign. Reach out to your customers with promotions, announcements and news, increasing sales and site traffic with our email marketing services. Progressive Commerce® offers email marketing services using permission-based, opt-in lists as a complete enterprise level email marketing solution, which includes the creation, setup, distribution and reporting of your emails. Each view and follow-through click is tracked in real-time, offering text-based and visual data flow and the ability to track open counts as your e-mail is sending. You will know how much sales or traffic was generated from your email, helping you determine the effectiveness of your campaign. Our powerful servers and software can support massive mailing lists that will receive your email quickly after distribution. You can send to recipients based on many factors, such as region, state or product preference from data that is collected by Channel Manager on a daily basis through customer orders, inquiries, and opt-in emails. You can send multiple emails under a single campaign to mutliple segmented lists using a list breakdown of your choice such as location, age range, etc - giving a wide range of possiblities to analyze and determine success of a promotion or interest of a product. Our Creative Services team can produce professional HTML emails to fit your needs or we can modify and update supplied materials sent to us. We also have an on-site Technical Support staff that can assist with any special requests or needs for your email marketing campaigns. We are in full compliance with Federal SPAM laws concerning unsolicited email, meaning your emails are less likely to be flagged as junk by mail servers. To help ensure your positive business image and maintain a good server reputation with major ISPs, we maintain a lifetime list of unsubscribes.